According to preliminary data, prices of old dwellings in terraced houses fell by an average of 0.5 per cent from the previous quarter in the whole country. 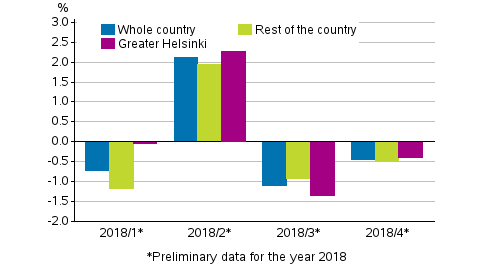 In Greater Helsinki, prices went down by 0.4 per cent and in the rest of the country by 0.5 per cent. Compared to the corresponding period in 2017, prices of old dwellings in terraced houses fell by 0.2 per cent in the whole country. In Greater Helsinki, prices went up by 0.6 per cent, while in the rest of the country they went down by 0.7 per cent. Prices of old dwellings in terraced houses went up in Kotka, by 12.4 per cent, in Hyvinkää, by 9.1 per cent and in Mikkeli, by 7.7 per cent. Prices went down in Kerava, by 8.2 per cent, in Lahti, by 7.3 per cent and in Kuopio, by 4.3 per cent compared to the previous quarter. Compared to the corresponding quarter in 2017, prices went up in Turku, by 7.6 per cent, in Joensuu, by 6.3 per cent, and in Porvoo, by 6.2 per cent. Prices fell by 7.4 per cent in Kuopio, by 4.8 per cent in Kouvola and by 3.4 per cent in Pori. In the last quarter of 2018, the average price per square metre of an old dwelling in a terraced house was EUR 1,895 in the whole country, EUR 3,321 in Greater Helsinki and EUR 1,564 elsewhere in the country. Prices of new dwellings in terraced houses fell in the whole country by 0.3 per cent from the previous quarter. In Greater Helsinki, prices went up by 1.1 per cent, while in the rest of Finland they went down by 0.8 per cent. Compared with the corresponding period of 2017, prices of new dwellings in terraced houses rose by 1.4 per cent in the whole country. In Greater Helsinki, prices rose by 3.4 per cent and in the rest of Finland by 0.7 per cent. In the fourth quarter of 2018, the average price per square metre of a new dwelling in a terraced house was EUR 3,065 in the whole country, EUR 4,045 in Greater Helsinki and EUR 2,845 elsewhere in the country. According to preliminary data, prices of old dwellings in terraced houses fell by 0.7 per cent in the whole country in 2018 compared with the previous year. In Greater Helsinki, prices went up by 0.7 per cent, while in the rest of Finland they went down by 1.6 per cent. Prices went up most in Turku, by 4.1 per cent, in Porvoo, by 2.9 per cent, and in Vantaa, by 2.1 per cent. Prices fell most in Mikkeli and Riihimäki, by 9.8 per cent. In Greater Helsinki, the price per square metre of an old dwelling in a terraced house was EUR 3,326 and in the rest of Finland EUR 1,612. Prices of new dwellings in terraced houses rose in the whole country by 0.4 per cent. In Greater Helsinki, prices went up by 2.4 per cent, while in the rest of Finland they went down by 0.3 per cent. The average price per square metre of a new dwelling in a terraced house was EUR 4,131 in Greater Helsinki and EUR 2,825 elsewhere in Finland. ISSN=2323-8801. December 2018, 2. Prices of dwellings in terraced houses fell in the October to December period . Helsinki: Statistics Finland [referred: 19.4.2019].